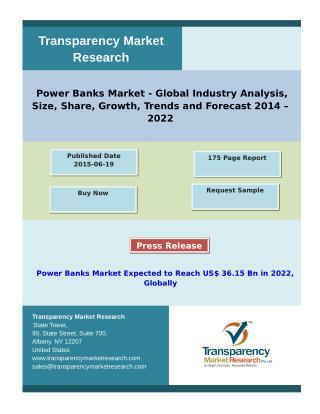 Power Supply Systems. 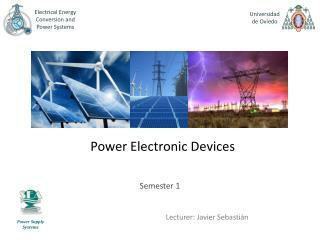 Electrical Energy Conversion and Power Systems . Universidad de Oviedo. 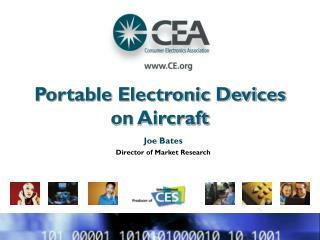 Power Electronic Devices. Semester 1 . 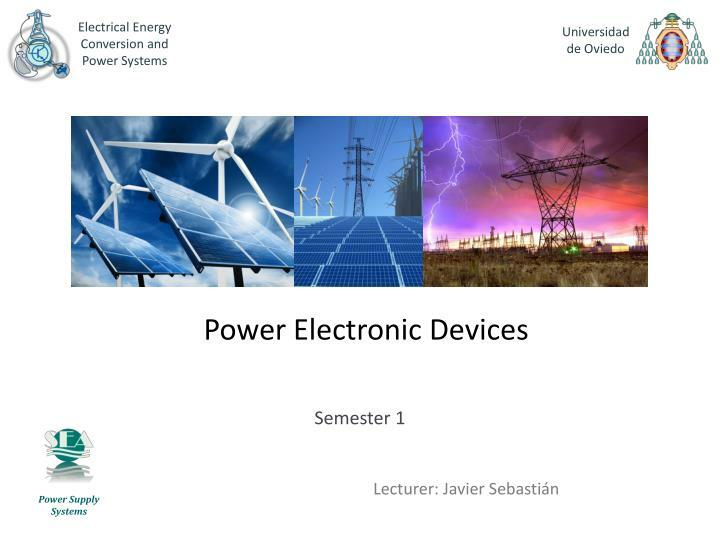 Lecturer: Javier Sebastián. Outline. 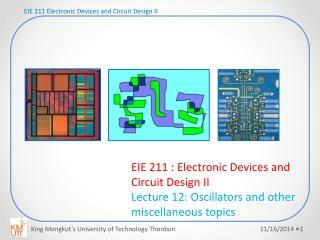 Review of the physical principles of operation of semiconductor devices. 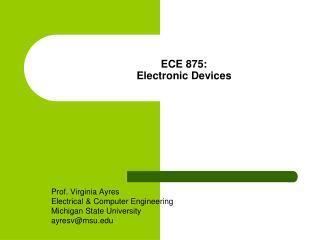 Review of the physical principles of operation of semiconductor devices. 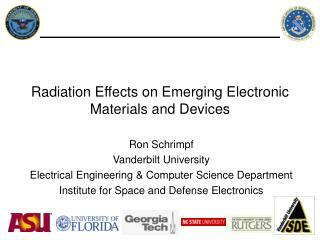 Thermal management in power semiconductor devices. 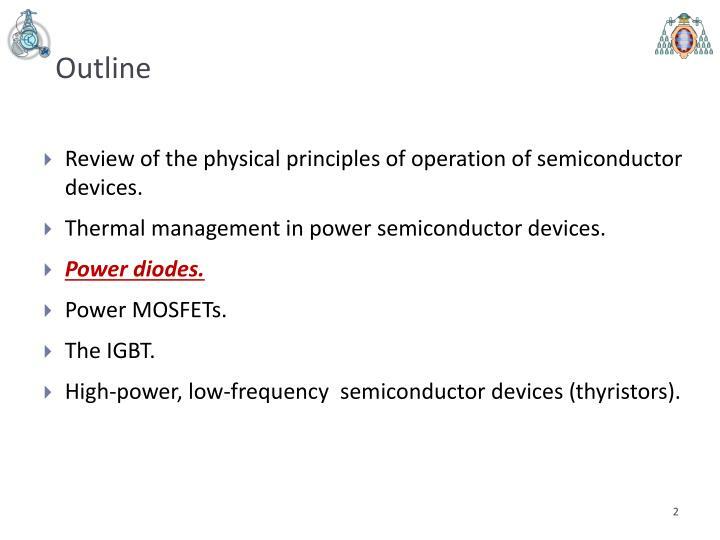 High-power, low-frequency semiconductor devices (thyristors). Lesson 3 - Power diodes. 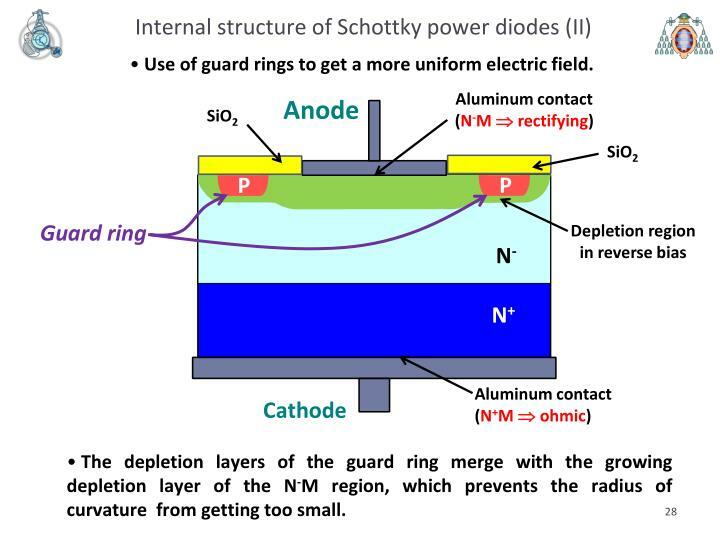 Internal structure of PN and Schottky power diodes. 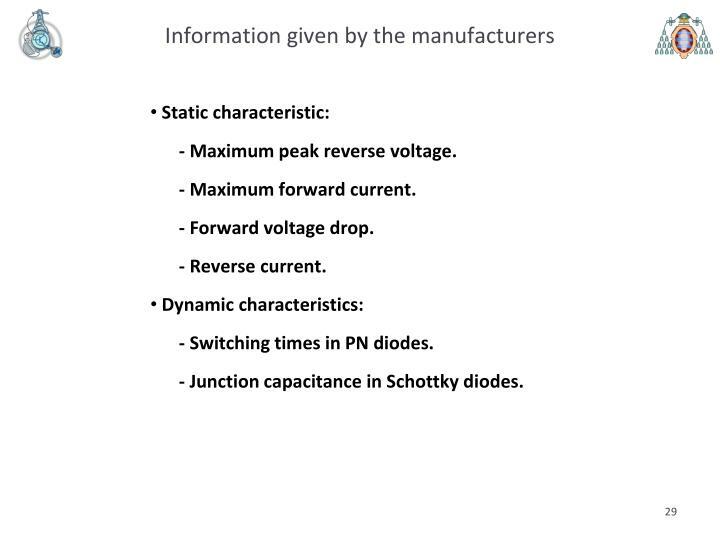 Static characteristic of power diodes. 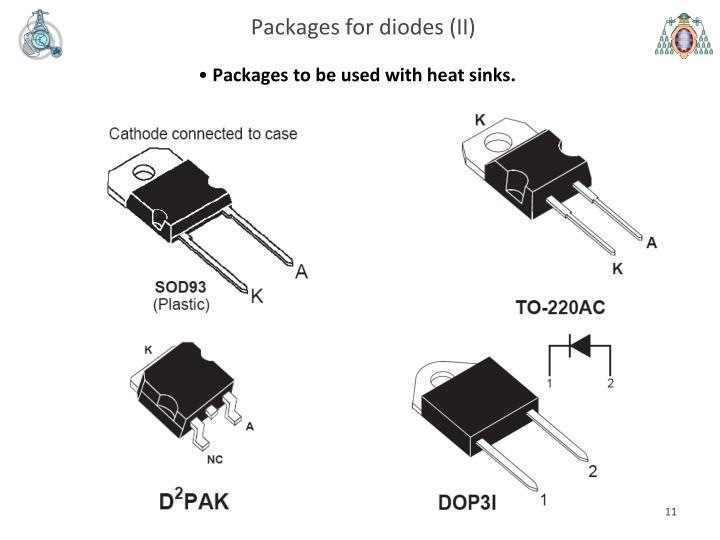 Dynamic characteristic of power diodes. 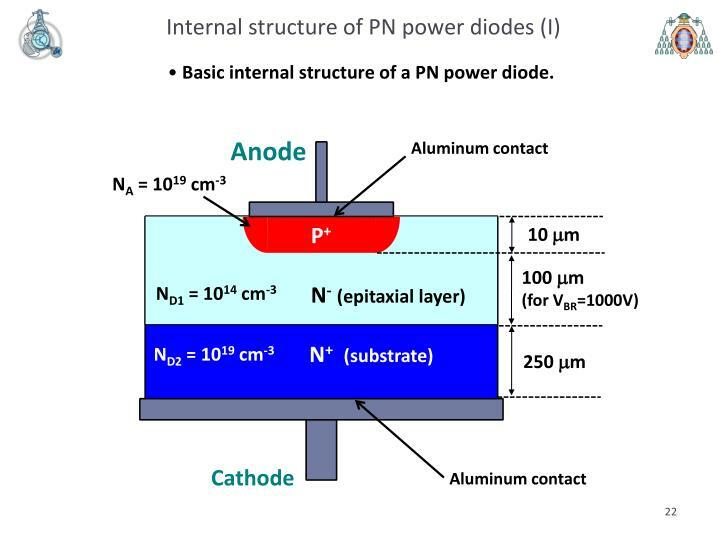 Modern diodes are based either on PN or Metal-semiconductor (MS) junctions. 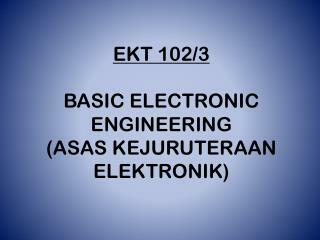 i = IS·(evext/VT- 1),where VT = kT/q and Is is thereverse-bias saturation current(a very small value). 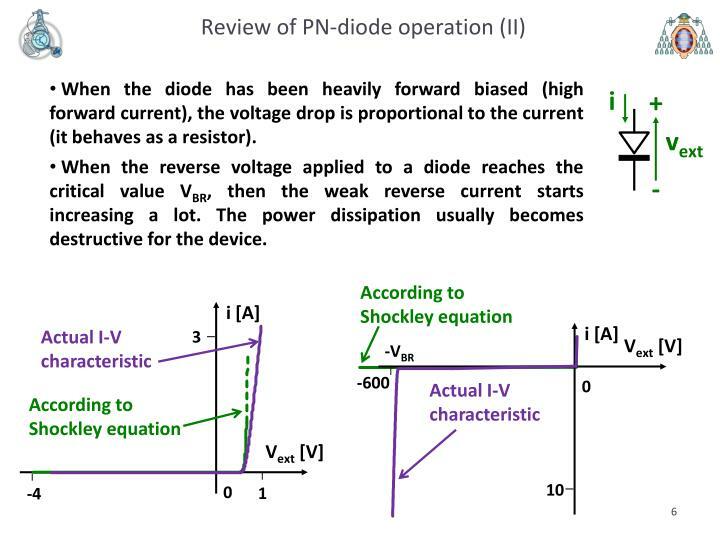 When the diode has been heavily forward biased (high forward current), the voltage drop is proportional to the current (it behaves as a resistor). 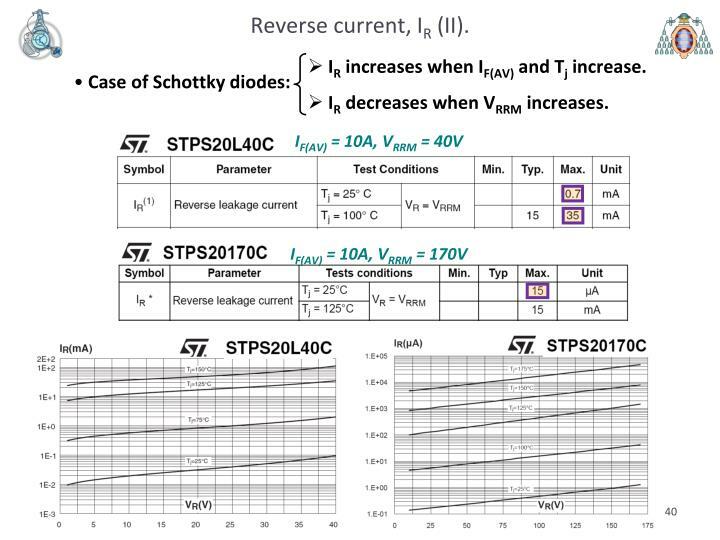 When the reverse voltage applied to a diode reaches the critical value VBR, then the weak reverse current starts increasing a lot. 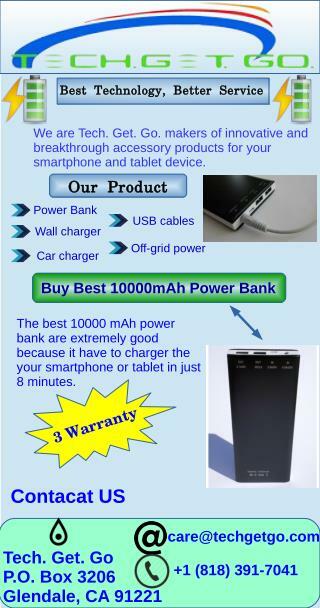 The power dissipation usually becomes destructive for the device. 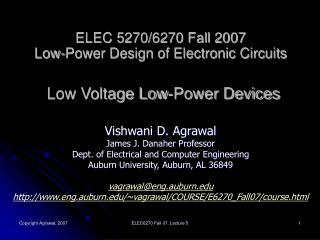 Whatever the forward current is, the forward voltage drop is always zero. 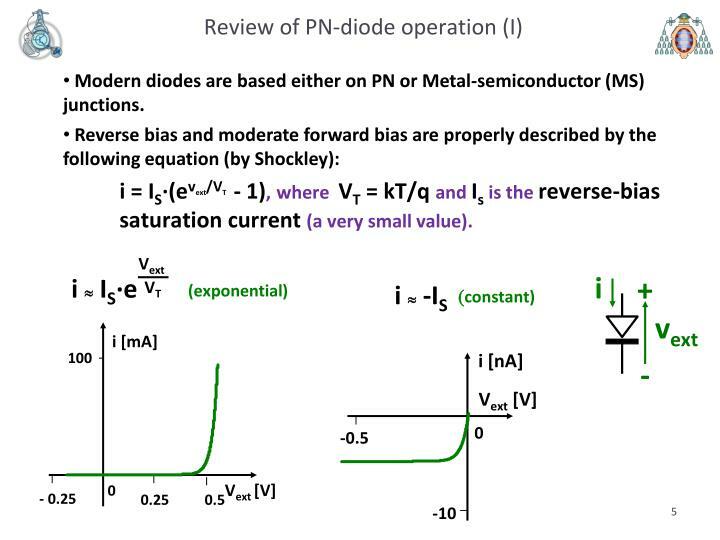 The ideal diode behaves as a short-circuit in forward bias. 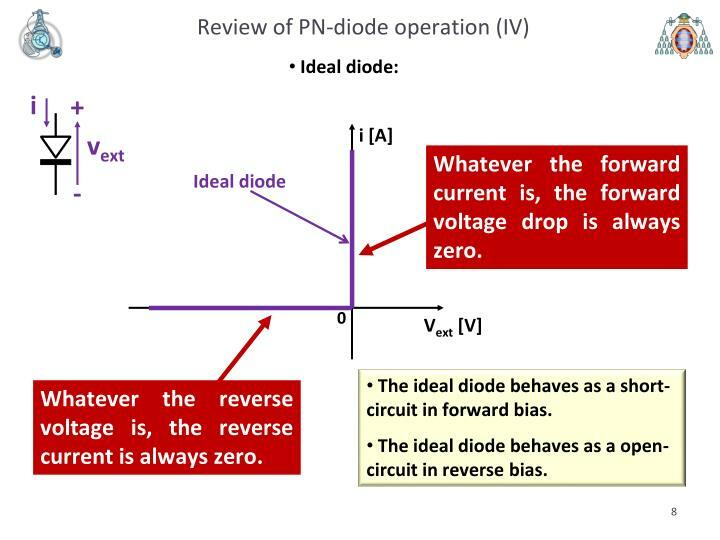 The ideal diode behaves as a open-circuit in reverse bias. 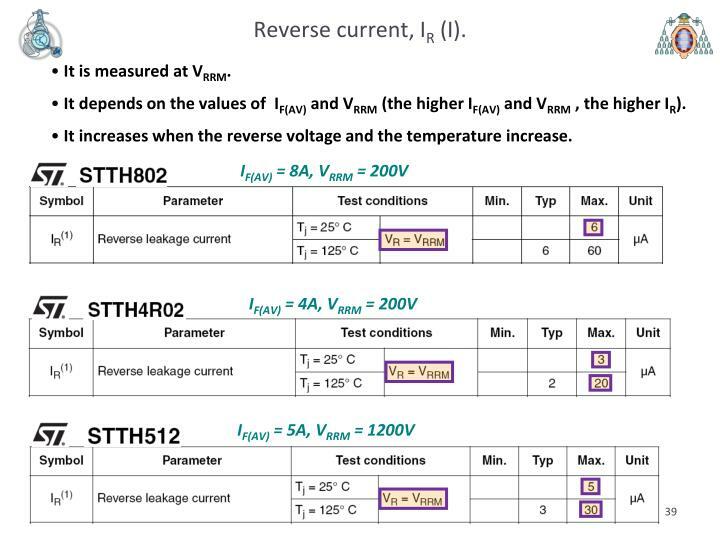 Whatever the reverse voltage is, the reverse current is always zero. 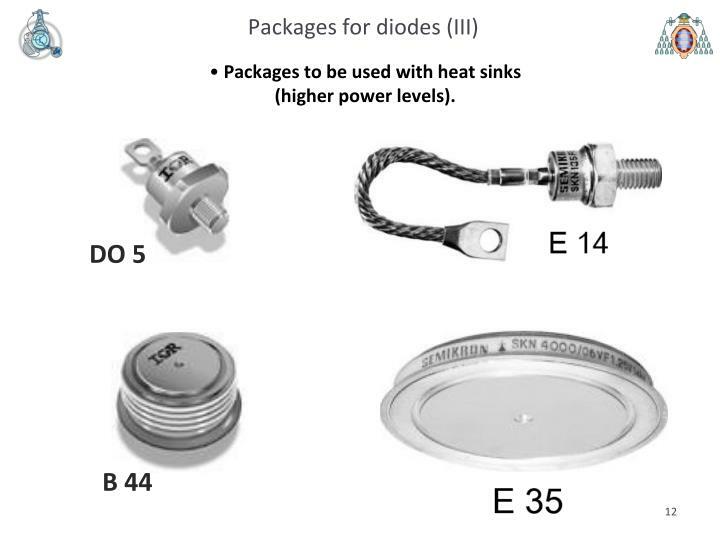 Packages to be used with heat sinks. 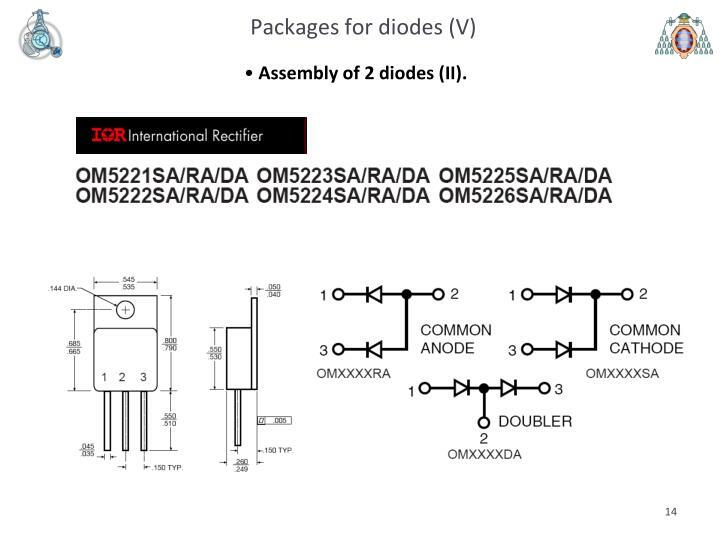 Assembly of 2 diodes (I). 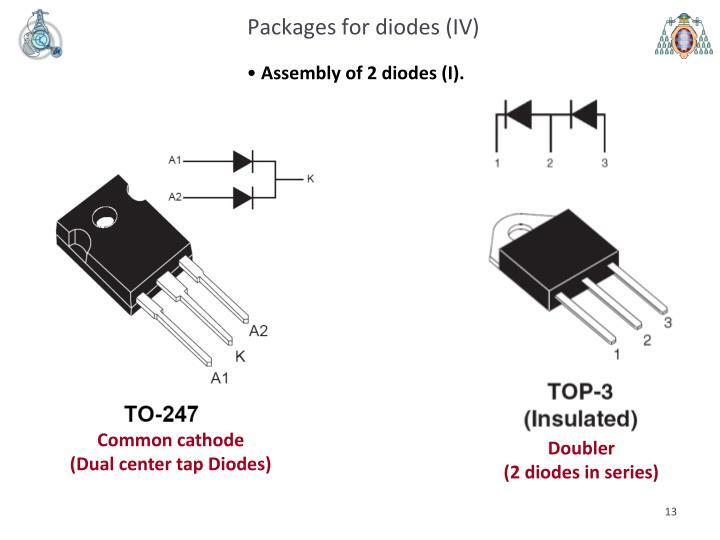 Assembly of 2 diodes (II). 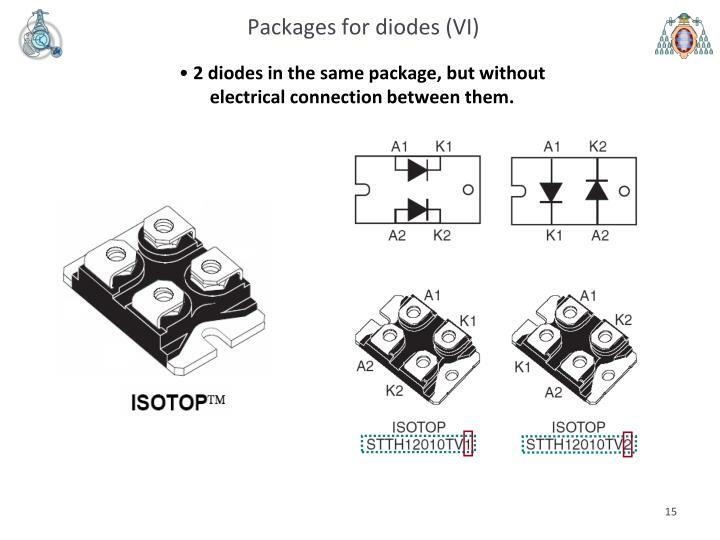 2 diodes in the same package, but without electrical connection between them. 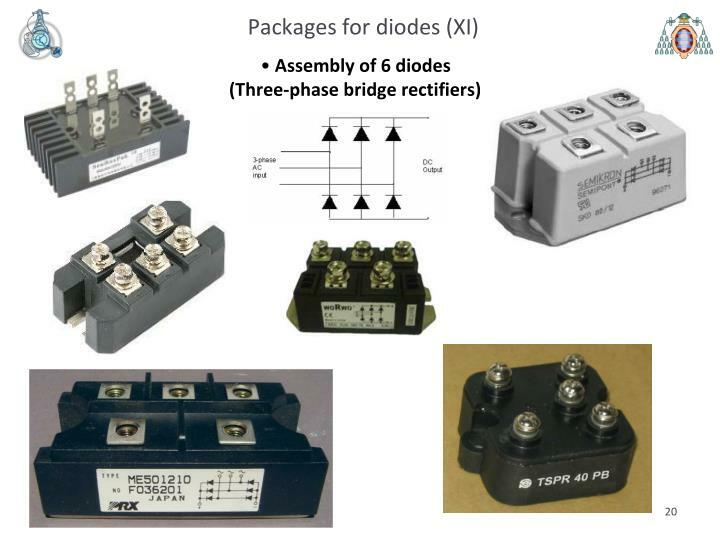 Manufacturers frequently offer a given diode in different packages. 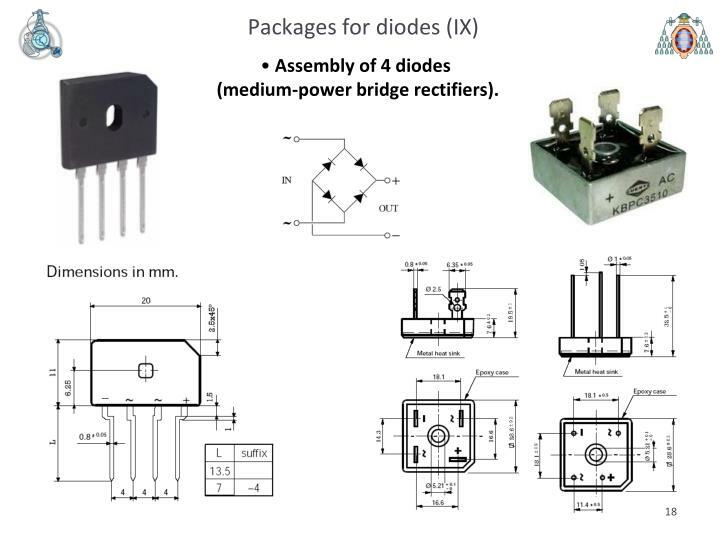 Assembly of 4 diodes (low-power bridge rectifiers). 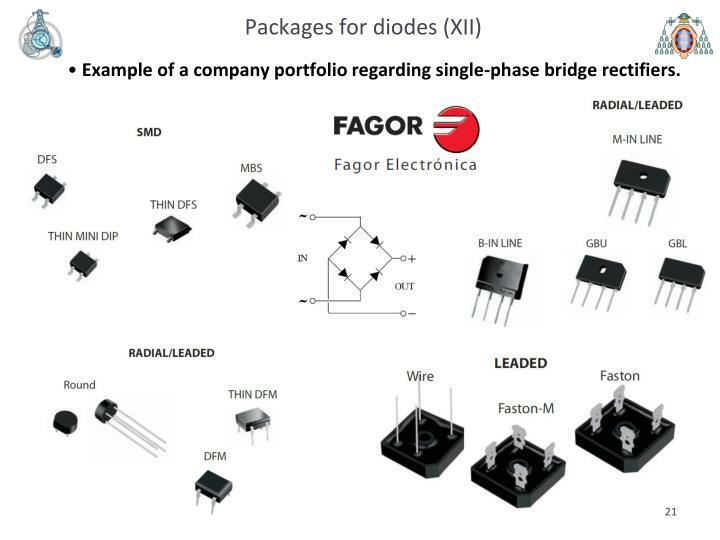 Example of a company portfolio regarding single-phase bridge rectifiers. 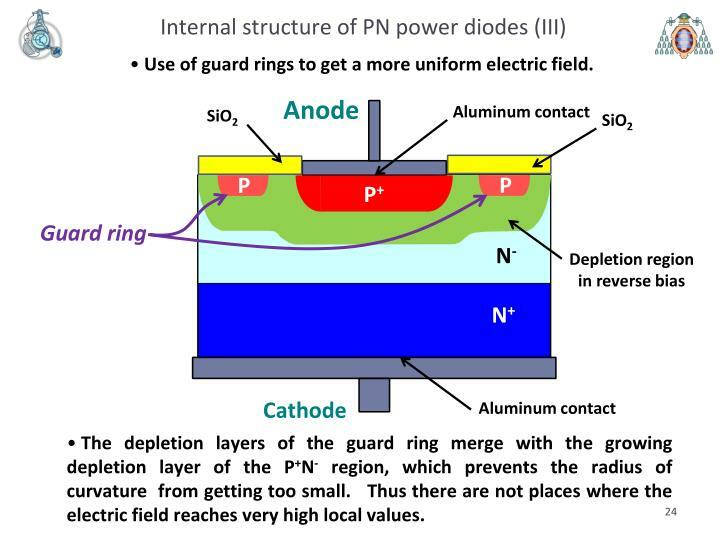 Basic internal structure of a PN power diode. Problems due to the nonuniformity of the electric field. 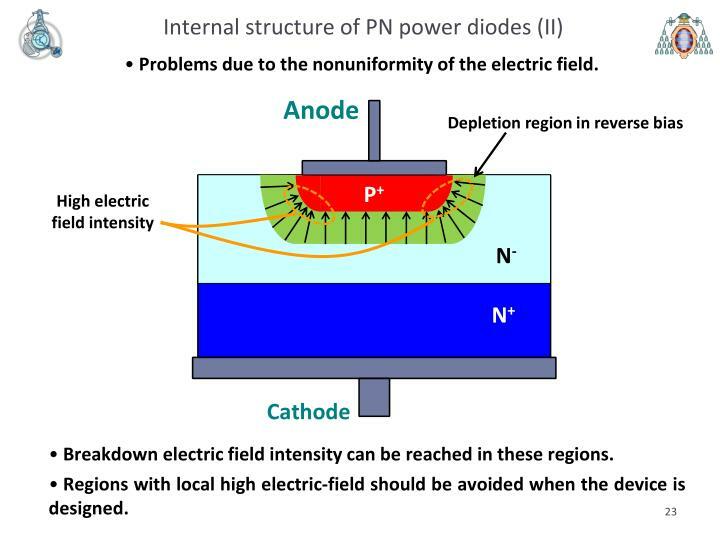 Breakdown electric field intensity can be reached in these regions. 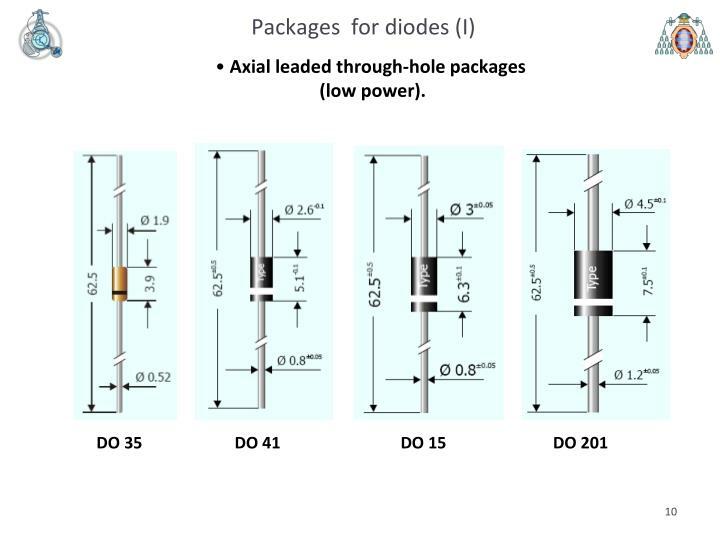 Regions with local high electric-field should be avoided when the device is designed. Use of guard rings to get a more uniform electric field. The depletion layers of the guard ring merge with the growing depletion layer of the P+N- region, which prevents the radius of curvature from getting too small. Thus there are not places where the electric field reaches very high local values. 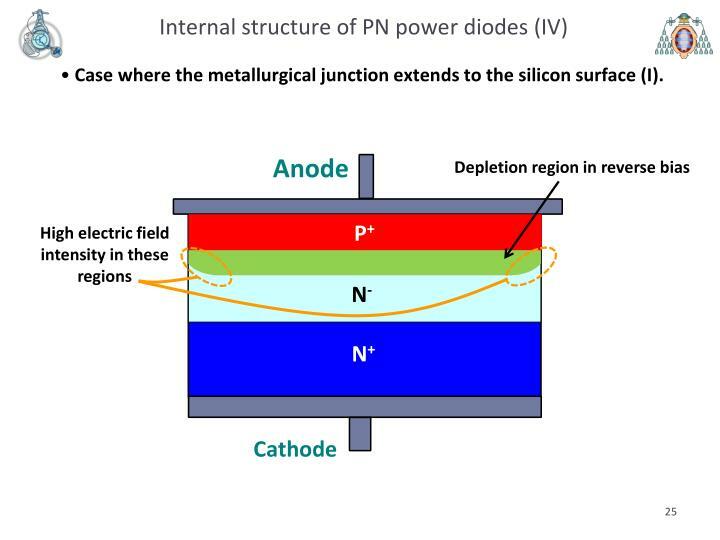 Case where the metallurgical junction extends to the silicon surface (I). Case where the metallurgical junction extends to the silicon surface (II). The use of beveling minimizes the electric field intensity. 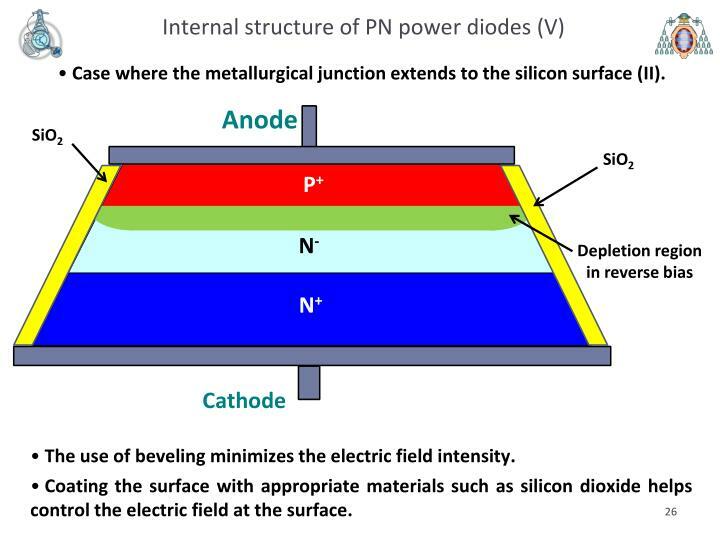 Coating the surface with appropriate materials such as silicon dioxide helps control the electric field at the surface. The depletion layers of the guard ring merge with the growing depletion layer of the N-M region, which prevents the radius of curvature from getting too small. - Maximum peak reverse voltage. 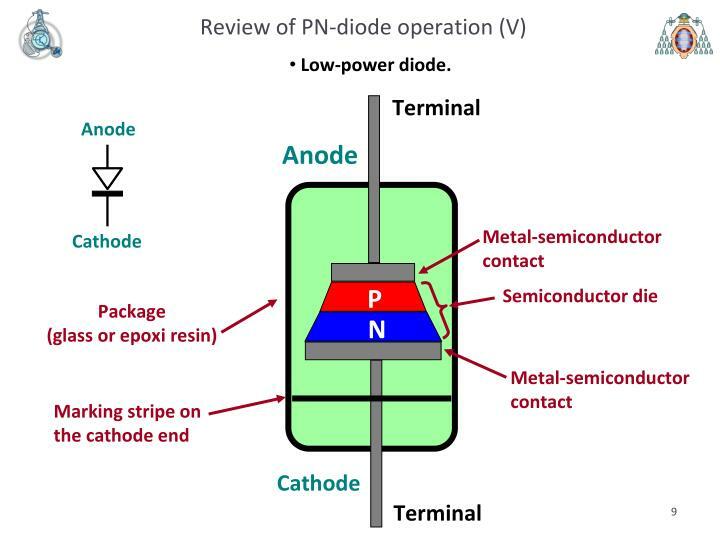 - Switching times in PN diodes. 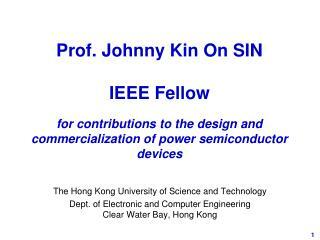 - Junction capacitance in Schottky diodes. - Maximum repetitive peak reverse voltage, VRRM. 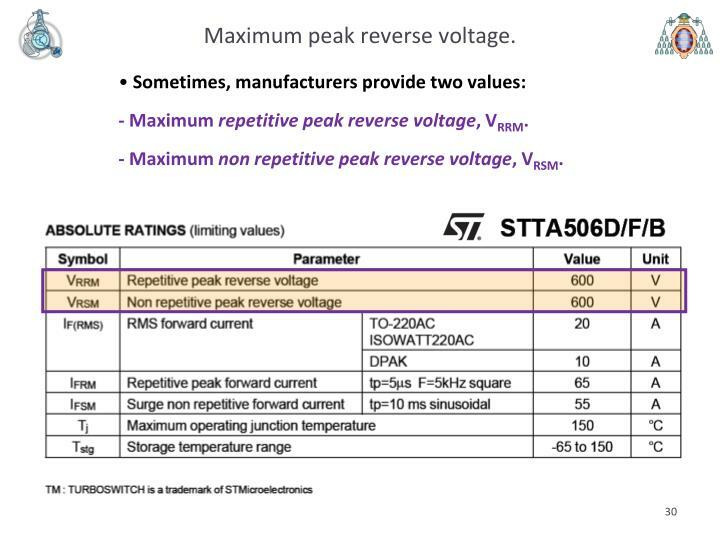 - Maximum non repetitive peak reverse voltage, VRSM. 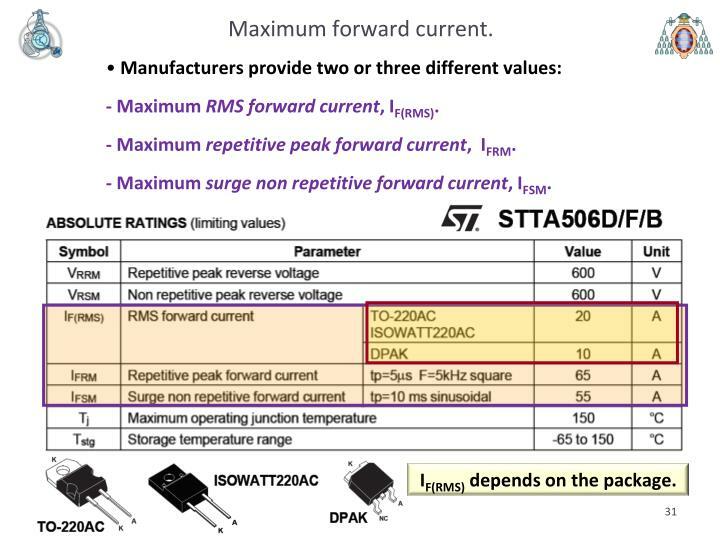 - Maximum RMS forward current, IF(RMS). 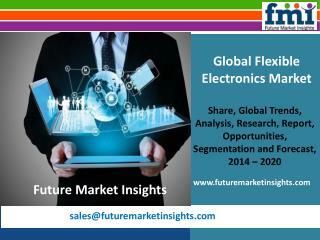 - Maximum repetitive peak forward current, IFRM. 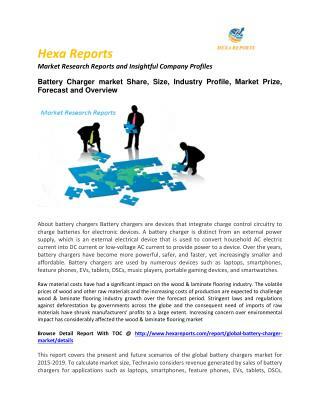 - Maximum surge non repetitive forward current, IFSM. IF(RMS) depends on the package. 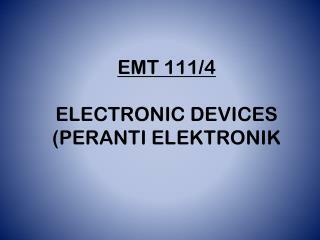 Forward voltage drop, VF (I). 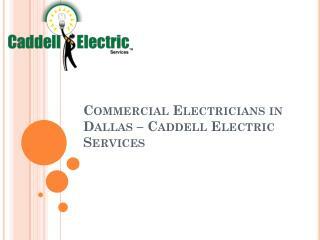 The forward voltage drop increases when the forward current increases. It increases linearly at high current level. Actual I-V characteristic given by the manufacturer (in this case is a V-I curve). Many times, current is in a log scale. 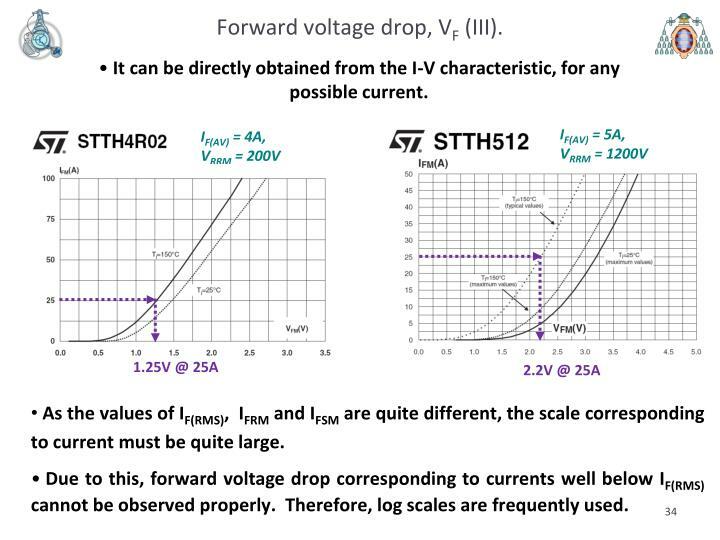 Forward voltage drop, VF (II). 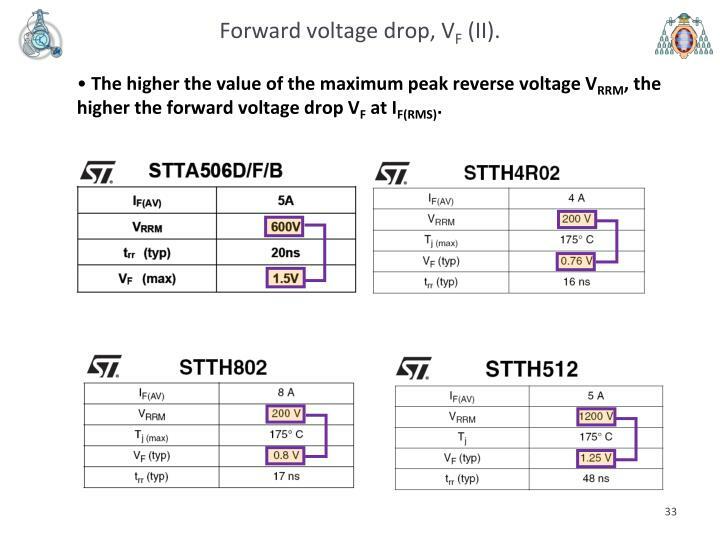 The higher the value of the maximum peak reverse voltage VRRM, the higher the forward voltage drop VF at IF(RMS). Forward voltage drop, VF (III). It can be directly obtained from the I-V characteristic, for any possible current. As the values of IF(RMS), IFRM and IFSM are quite different, the scale corresponding to current must be quite large. Due to this, forward voltage drop corresponding to currents well below IF(RMS) cannot be observed properly. Therefore, log scales are frequently used. 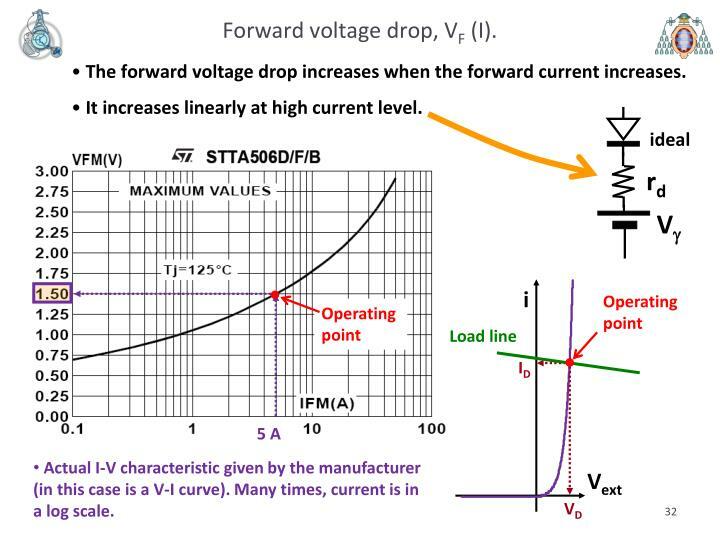 Forward voltage drop, VF (IV). 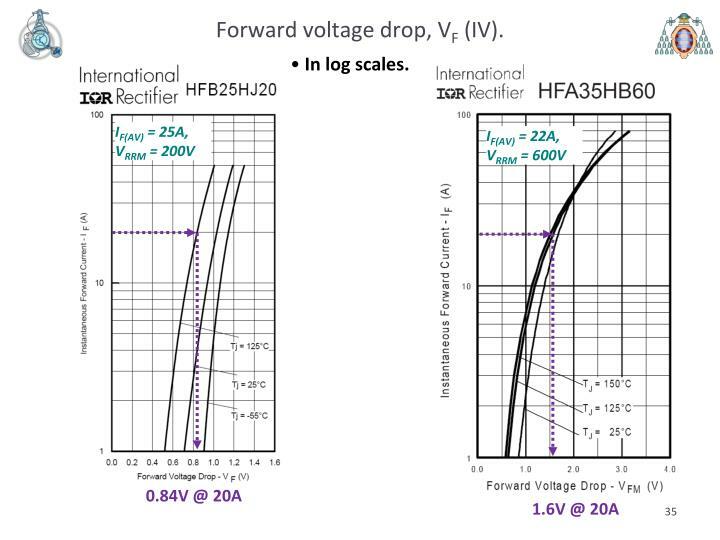 Forward voltage drop, VF (V). 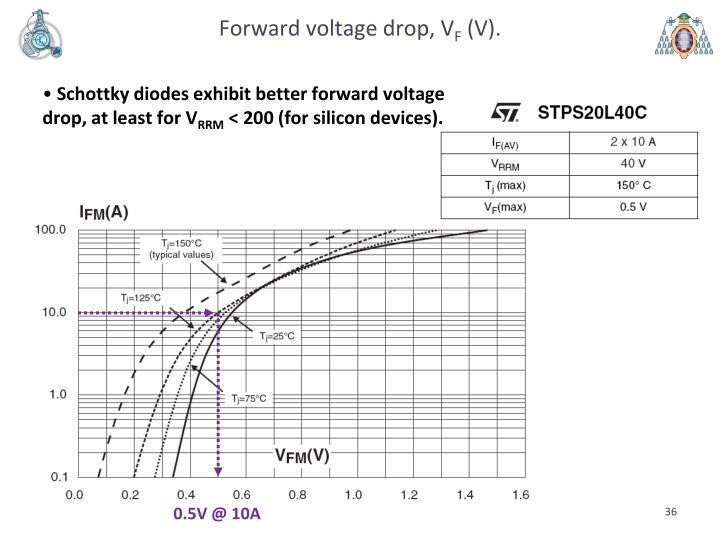 Schottky diodes exhibit better forward voltage drop, at least for VRRM < 200 (for silicon devices). Forward voltage drop, VF (VI). 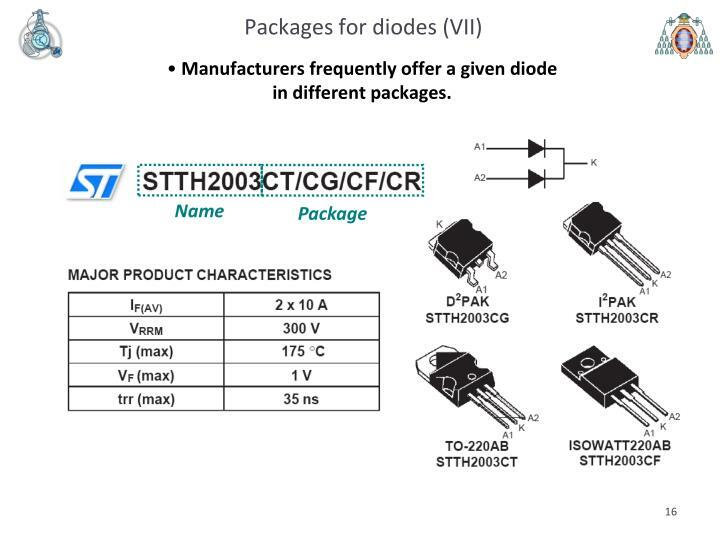 Silicon Schottky diode with high VRRM. 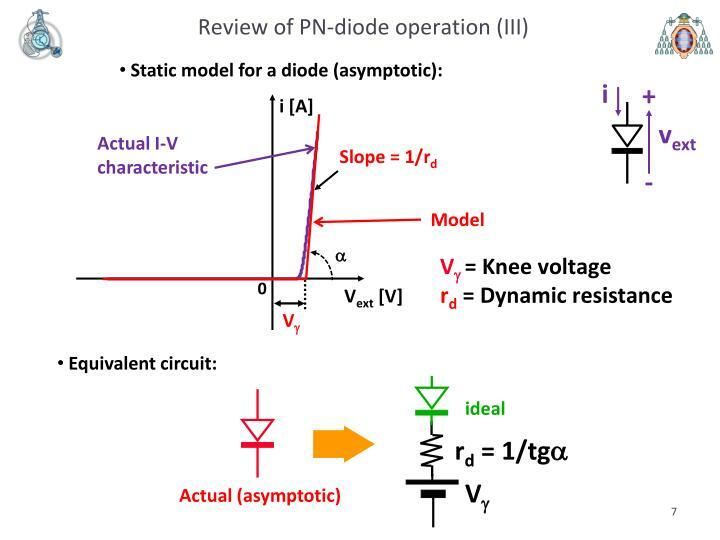 The forward voltage drop is quite similar to the one corresponding to a PN diode. Forward voltage drop, VF (VII). 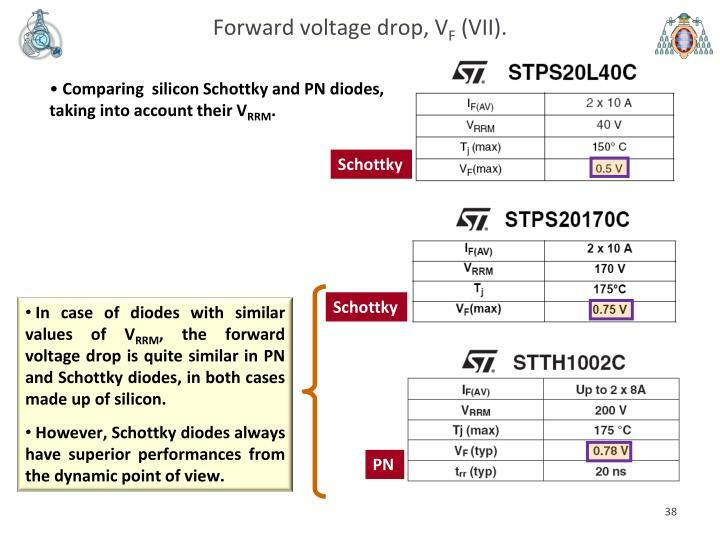 Comparing silicon Schottky and PN diodes, taking into account their VRRM. 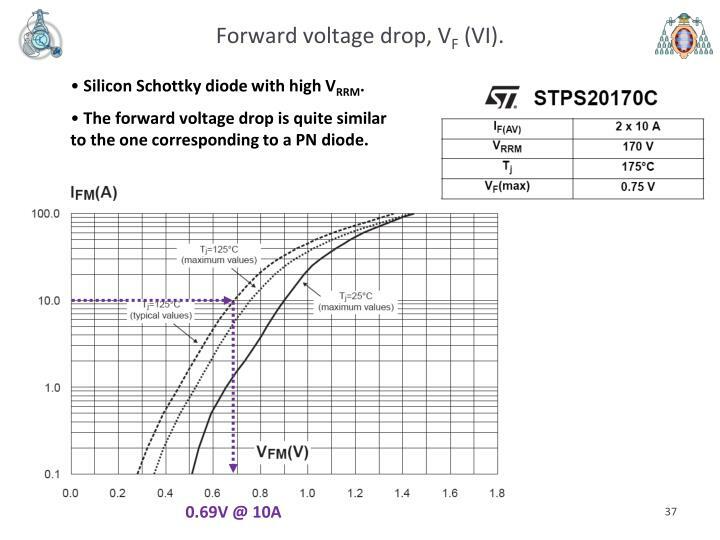 In case of diodes with similar values of VRRM, the forward voltage drop is quite similar in PN and Schottky diodes, in both cases made up of silicon. 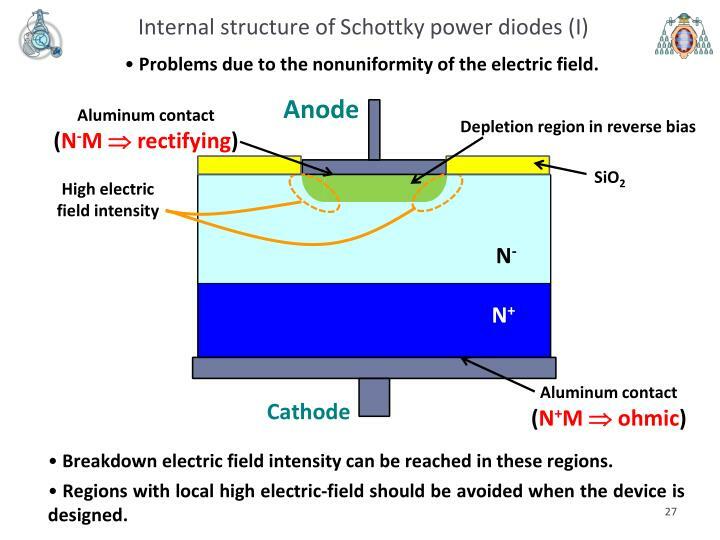 However, Schottky diodes always have superior performances from the dynamic point of view. It depends on the values of IF(AV) and VRRM (the higher IF(AV) and VRRM , the higher IR). 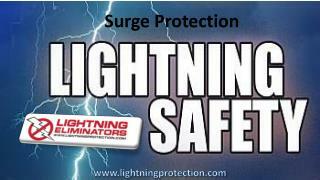 It increases when the reverse voltage and the temperature increase. IR increases when IF(AV) and Tj increase. IR decreases when VRRM increases. 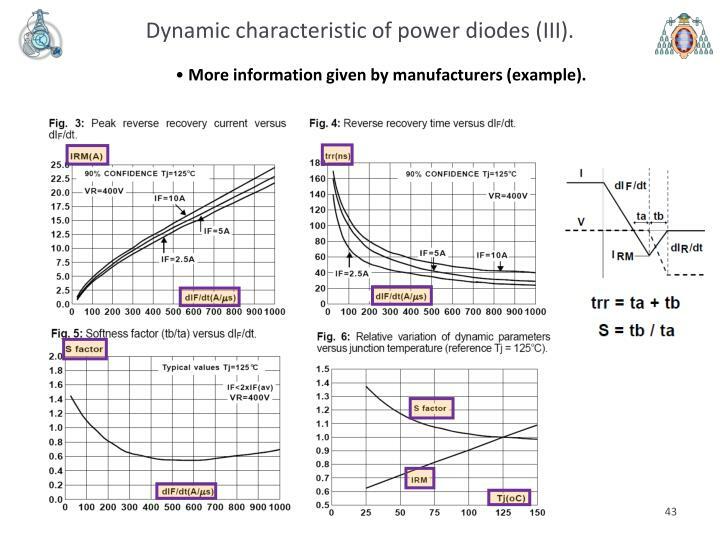 Dynamic characteristic of power diodes (I). 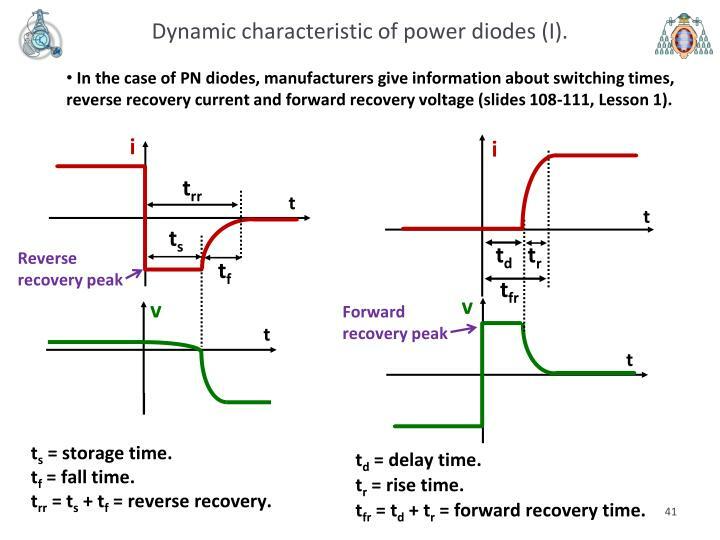 In the case of PN diodes, manufacturers give information about switching times, reverse recovery current and forward recovery voltage (slides 108-111, Lesson 1). trr = ts + tf = reverse recovery. tfr = td + tr = forward recovery time. 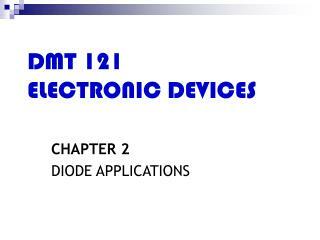 Dynamic characteristic of power diodes (II). 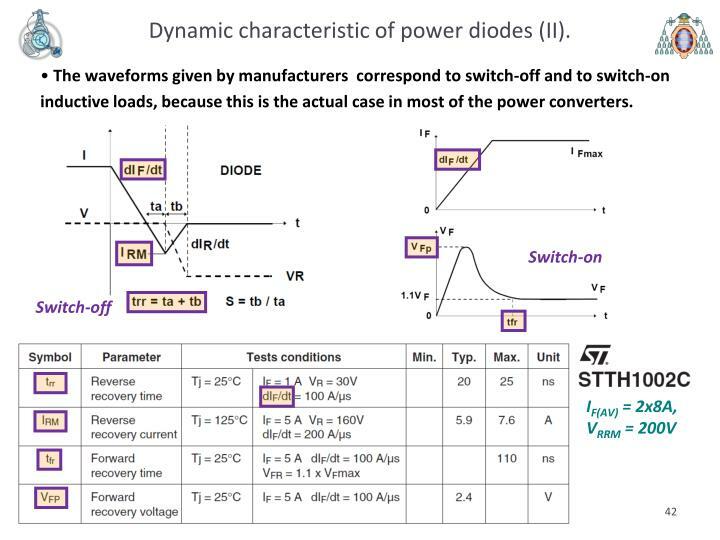 The waveforms given by manufacturers correspond to switch-off and to switch-on inductive loads, because this is the actual case in most of the power converters. 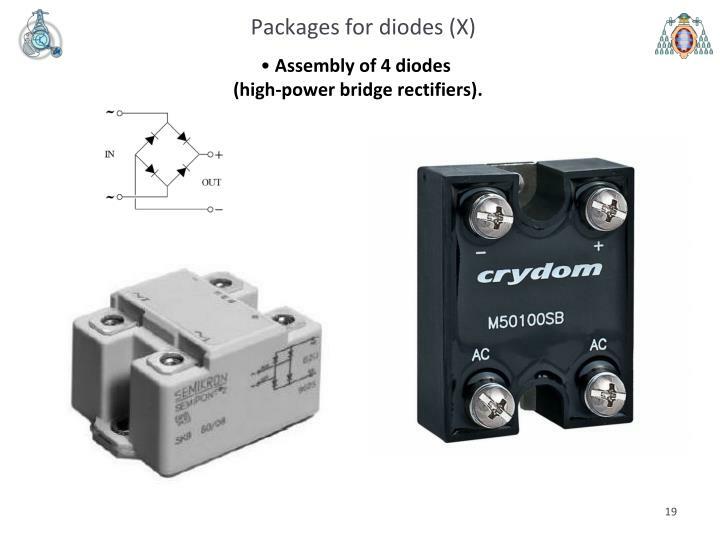 Dynamic characteristic of power diodes (III). 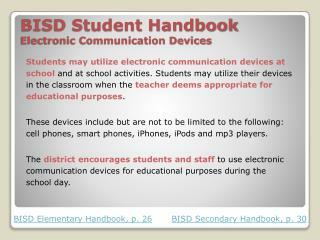 More information given by manufacturers (example). 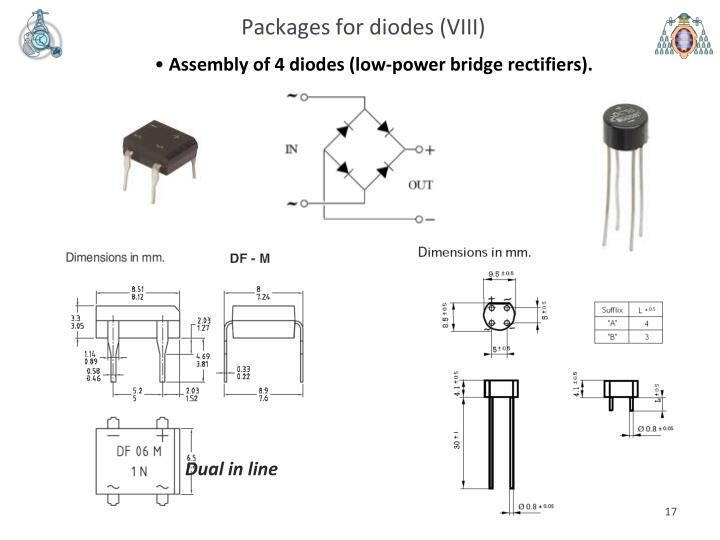 Dynamic characteristic of power diodes (IV). 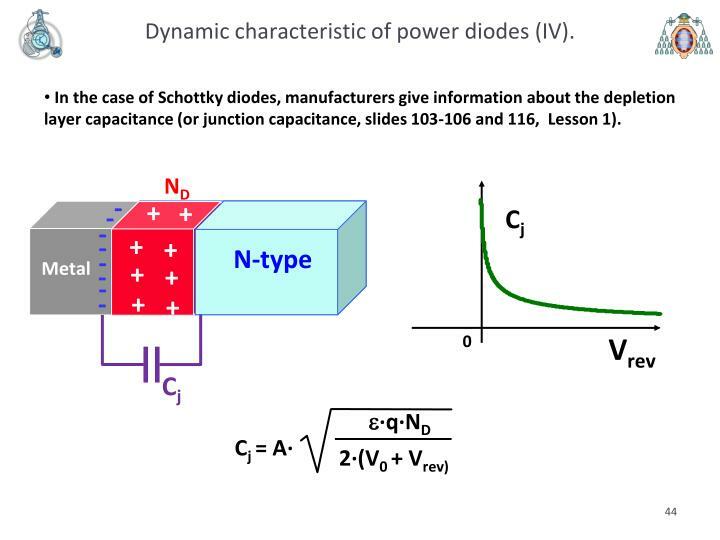 In the case of Schottky diodes, manufacturers give information about the depletion layer capacitance (or junction capacitance, slides 103-106 and 116, Lesson 1). 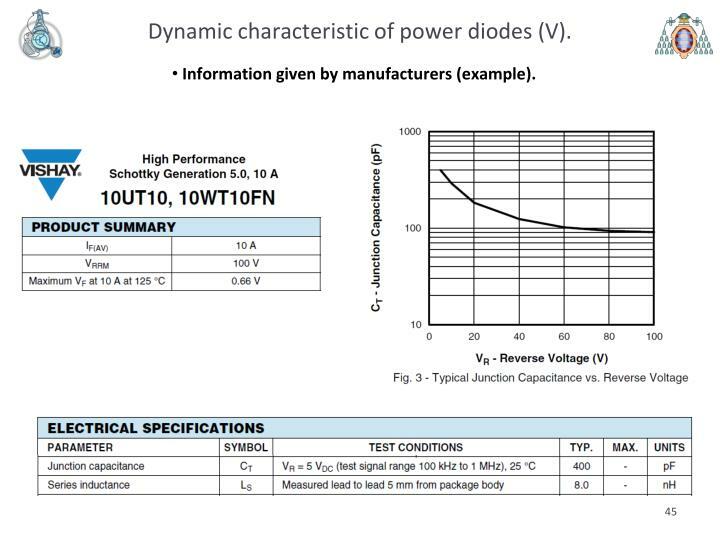 Dynamic characteristic of power diodes (V). Information given by manufacturers (example). 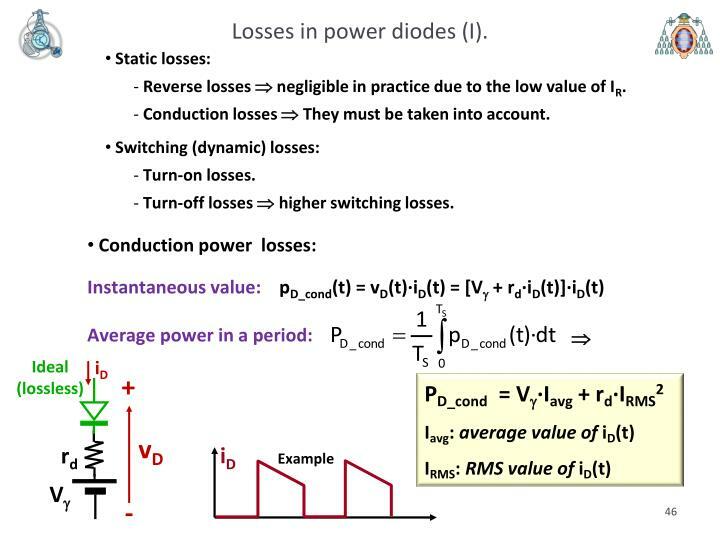 Losses in power diodes (I). Reverse losses Þ negligible in practice due to the low value of IR. Conduction losses Þ They must be taken into account. Turn-off losses Þ higher switching losses. 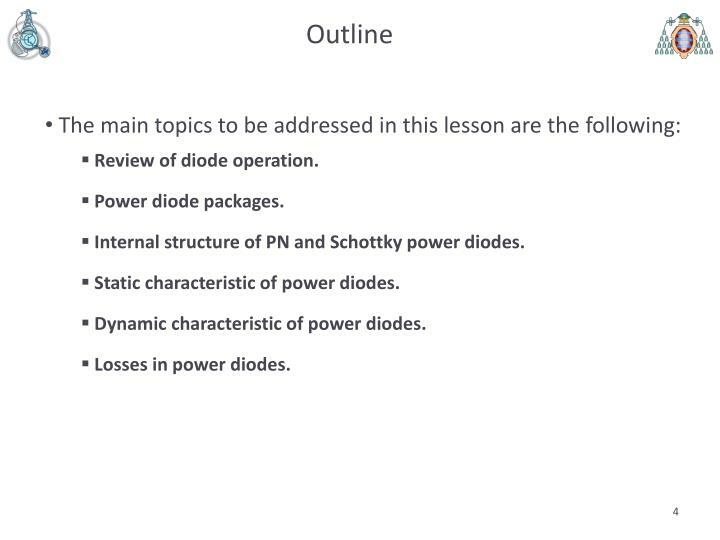 Losses in power diodes (II). 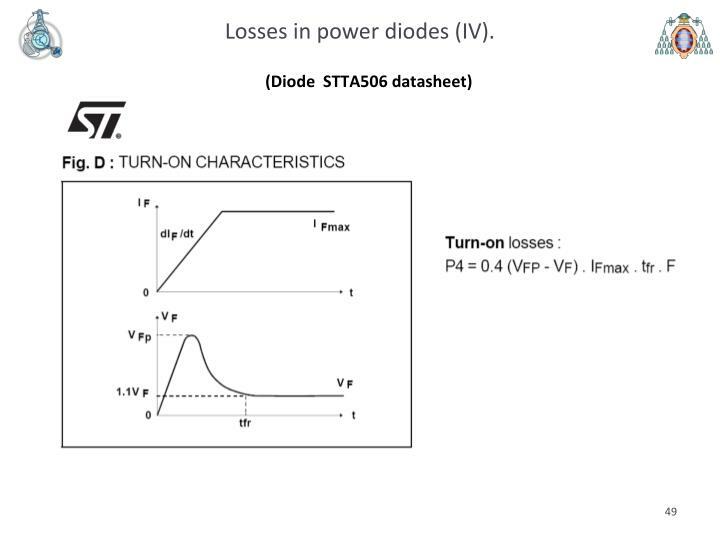 Turn-off losses in the diode take place during tf. 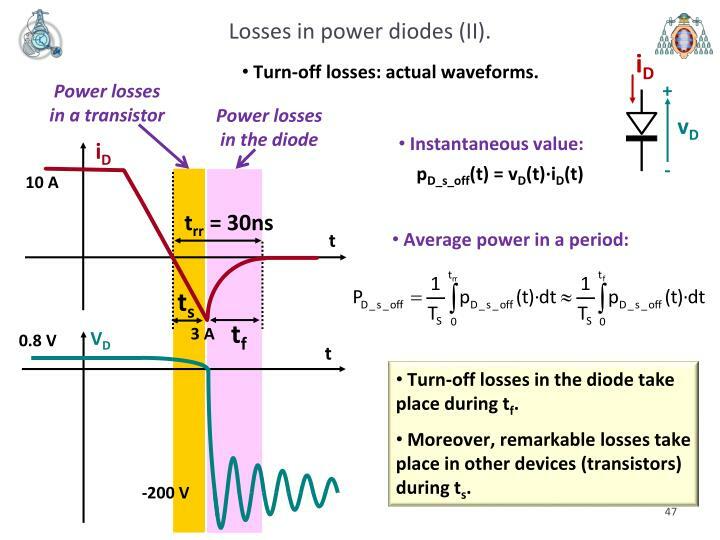 Moreover, remarkable losses take place in other devices (transistors) during ts. 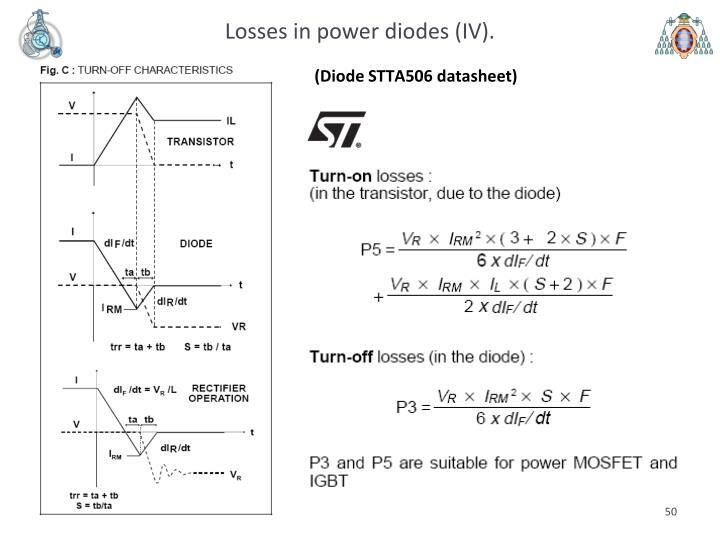 Losses in power diodes (III). 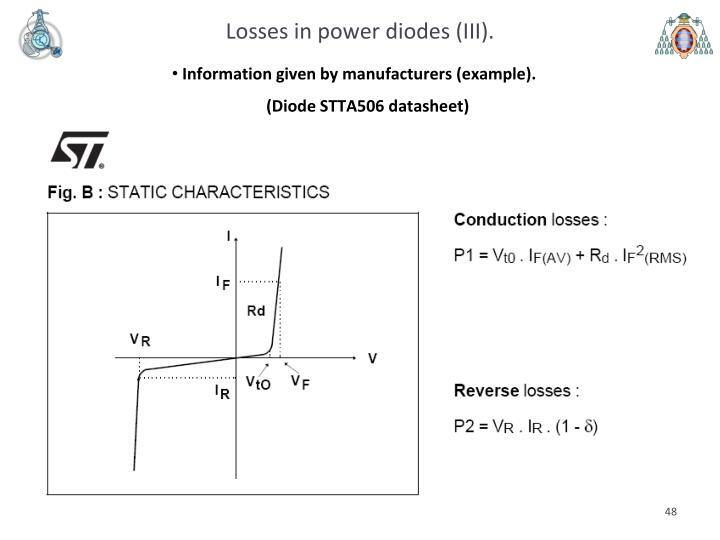 Losses in power diodes (IV). 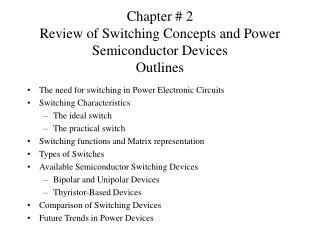 Groups.yahoo -Chapter 1 review of power electronics converters . 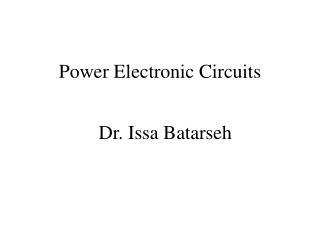 power electronics refers to control and conversion of electrical power by power semiconductor devices wherein these devices operate as switches. . "electronic power converter"